In my writing, I strive for CLARITY to create a slick and precise German translation. A text that I am proud to sell. Precision and Clarity best describe my principles when translating or editing a scientific text. I have been working as a full-time linguist for the last 4 years and my daily workload includes translation projects for industry and private customers alike. I feel competent as well as comfortable in producing medical translations plus localisation for both patient-facing and specialist-facing content. I am fully up to date with the 2019 standards for Medical devices such as ISO 13485. My native language is German and I am offering my translation expertise in the fields of clinical, commercial and academic medicine from English or French sources. I specialise in clinical content as well as general Health topics relating to nutrition, fitness or rehabilitation; such formats may include research papers, publications, reports, doctors letters, leaflets but also general promotional material. I provide translation and localisation services of personal Medical Records which include clinic letters, radiology reports or hospital discharge summaries, even handwritten notes. 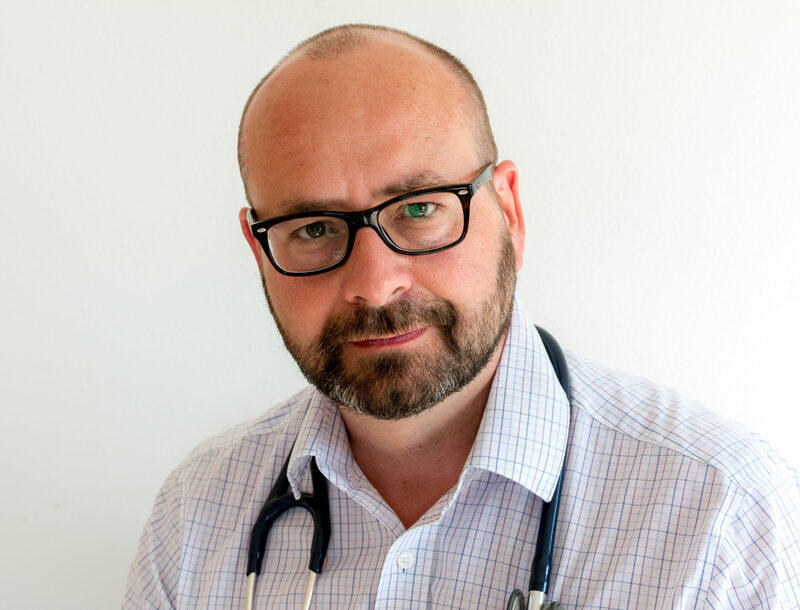 With a background of medical training in Switzerland and 15 years of clinical practice in the UK, I have an experienced comprehension of medical content. In addition, I offer translations of patient notes from German or French sources into English – a useful service for customers who need their foreign medical information adapted to standards of the National Health Service (NHS). Ever since I was a little boy I had a taste for foreign languages. I loved to watch Italian cartoons or tried to translate jokes inside the Carambar wrapper (a French candy). Perhaps the reason I ended up studying Medicine “en français” at the University of Geneva where I graduated with the “Swiss Federal Diploma of Physician” in 1999. Shortly after graduation, I moved to the UK where I worked for 15 years as a doctor for the NHS, gaining experience in various specialities such as geriatrics, surgery, paediatrics, gynaecology, emergency medicine and general practice. Translating medical reports into German was initially on a voluntary basis for the NHS but has gradually become a big part of my professional life, and I started charging for my services. Particular interests of mine are Health Information Technologies and the processing of Medical Data for diagnostic or therapeutic purposes. Having left the hustle and bustle of London, I am now living part-time in Slovenia, working as a freelance translator, cycling through nature, making cheesecake and getting familiar with my first Slavic language. From the nutritional benefits of beetroot to the latest advances of Immunotherapy against Leukaemia, medical writing covers a vast area. Depending on the target audience, terminology and level of jargon can become very expert and scholarly. Through training and practice, I have become accustomed to all levels of Medical Discourse and developed a methodology on how and where to accrue more in-depth information. Outside the clinical realm, I have expertise with market research translations and website translations for health-related organisations. Like all medical information aimed at patients, translations of such content should be kept simple. When signing up for a clinical study, a patient should fully comprehend the ins and outs of the trial without specialist knowledge – hence be able to give informed consent. These texts have to be free from jargon and unfamiliar terms. If a word cannot be expressed with simple terms it should be defined before using it. To prevent any confusion, words with different meanings should be avoided, and once a term is being utilised, it should be applied throughout the text and not be replaced with synonyms. The Focus is on READABILITY – Substance comes before Style. When I needed a translation of my UK hospital discharge summary for a Rehab Clinic in Austria I contacted Oliver. He did a great job and gave me some useful tips. Oliver did our website translation for 2019 – He has high standards and is very professional. We would like to thank him for his high quality product. I needed an English into German medical translation for the German court. Oliver did it for me immediately. It was very accurate & professional. He was very quick to reply & very helpful. I would highly recommend him.